The 19 firefighters killed in Arizona were part of an elite team known as a "hotshot" crew, specially trained to deal with wildland fires. What is it like? The wall of flames, nearly 300ft (91m) tall, was racing up the mountain towards her. But Kim Lightley froze. "I guess I was resolved to the fact I wasn't going to survive, so for a fleeting moment, it was OK," she said. A 23-year-old "hotshot" from Oregon, Lightley was a long way from home, fighting one of the most deadly wildland fires in the history of Colorado. She knew that half her unit were behind the flames and she was resigned to joining them. One attempt to run for her life had already failed when that escape route became blocked. Unable to follow her superintendent's instruction to deploy her emergency shelter, she only came out of her shock when he struck her on the head. She eventually made her escape, along with eight others. That was her last fire. The events of that day in 1994, in which 11 of her friends died in the South Canyon Fire on Storm King Mountain, still haunt her and never more so the day after 19 firefighters died in a wildland fire in Arizona. Tackling wildfires of these types is a job like no other - people within the fire service describe hotshots as "different breeds of people", such are the unique demands of living in the wilderness for days and weeks on end. 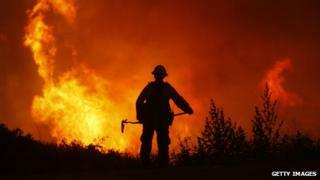 There are about 110 "hotshot" crews across the US, mostly located in the south-west, each with about 20 members. Their main task is to scour a "fire line" in the landscape, a break between the fire and nearby homes by removing anything that could fuel the flames - brush, trees, vegetation. It is hard work - they have to dig, chainsaw, scrape and carry, while always being aware of the fire's location and their escape routes. Gene Rogers once spent 38 consecutive days fighting a half-million-acre fire in south-west Oregon in 1987. "A lot of that time I was 'spiked out', which means a small camp in a wilderness area, typically supplied by helicopter, so water, food, gasoline and other supplies are flown in," he said. "The camp moves along as progress is made on the fire." You sleep on the ground in your fire clothing, says Rogers, who led a hotshot crew for four years. Working the nightshift presented other hazards - falling trees and rolling rocks outside the vision of your headlamp. "A lot of folks in the business will admit to being adrenaline junkies," says Rogers, now in his 44th year in the fire service. "It's quite like being on a sports team that's winning, and that feeling helps overcome the exhaustion." Wherever they are, during wildfire season hotshots are at all times expected to be ready and on the road within two hours, says Alex Abols, a former hotshot who is now a "smokejumper" who parachutes into wildfire zones as part of an early response team. "It's a big commitment, a big sacrifice for the summer, from May to October. You're pretty much spending that time working," he said. "It's extremely difficult, extremely challenging, extremely rewarding work, not only putting yourself to the test but establishing an 'esprit de coeur' within your crew." Motivation, integrity, a solid work ethic and an optimistic perspective are the key qualities, says Abols. And then there are the physical fitness requirements. For example, you'll never be a hotshot if you can't hike three miles carrying a 45lb (20.4kg) pack in less than 45 minutes. Plus there's running, pull-ups, push-ups and more. "Most guys spend the bulk of winter getting in shape for the oncoming season," says Abols, who compares hotshots and smokejumpers to military special forces. Training experienced firefighters in the ways of wildland fires takes two weeks. And bonds are soon formed that last for life. For Lightley, who now gives talks to firefighters about the lessons she learnt, those bonds were broken in the most painful way possible, destroying the invincibility she had felt until that moment. "There wasn't any fear, just 'we can do this'," she said. "You see the plume of smoke and the planes dropping retardant and you think, 'Let's do this, this is our mission. Things won't go awry.' So when they do, it shatters your world and all your perceptions." But the unique experience of taking on nature at its most ferocious, armed with nothing more than what she carried, is one she will never forget. "I'm smiling right now through the broken heart," she said. "It was the best life you could ask for."